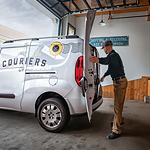 One of the most popular passenger wagon and cargo vans on the road today is the Ram ProMaster City. It's ability to safely transport workers and equipment from job site to job site has made it one of the most durable vehicles on the market today. That is why we here at Lithia Chrysler Jeep Dodge of Billings are extremely excited to announce the arrival of the all-new 2018 model! First, drivers will love the 5 year and 60,000 mile gas powertrain limited warranty. Additionally, they will also be able to benefit from a 3 year and 36,000-mile basic limited warranty. This way, if anything should happen to the vehicle in the first few years of ownership, it will be fully covered at no cost to you. Finally, drivers will be able to sleep easy knowing that they have a 5 year or 100,000-mile (whichever should come first) rust through limited warranty.